Sidney John Karels, son of William and Rose (Cordes) Karels was born in Buffalo Center Iowa on March 22, 1956. 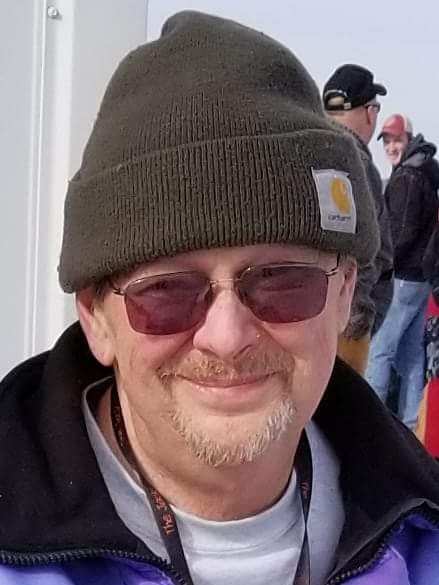 Sidney began elementary school at Bancroft Public Schools and later completed his education at Burt Community School where he graduated with the class of 1974. Sid went on to study auto body at Iowa Lakes Community College where he earned his degree. Sid began his career doing auto body work at a shop in Algona and also briefly worked at Brohms in Algona. He then began working at Fibre Body/BrandFX in Swea City where he used his auto body training to work on composite molds. He worked for Fibre Body for close to 34 years and just recently retired for health reasons. Sid really enjoyed spending time on outdoor hobbies: bow-hunting, fishing, camping, four-wheeling, helping friends with race cars and watching car races. He also had a love of snowmobiling and took pride in restoring vintage snowmobiles which he took to several shows and entered in parades. Sid had many dear friends and buddies that he thoroughly loved spending time with, which meant so much to him. Sid was a kind-hearted, humble man, & his faith, his family and friends were at the top of his list. In 2012, Sid began his battle with cancer and the struggle to keep his health. On March 31st of this year, Sid enjoyed a big surprise get-together for him, to celebrate his 62nd birthday and his retirement. Sid so enjoyed the day with family & great friends. On Friday, June 15th, 2018, Sid lost his battle to cancer at the age of 62. He was able to stay active right up until that day and had even enjoyed attending the car races the night before with his son, Joshua & his family. Sidney is survived by Rose, his wife of 30 years, son, Joshua (April) Karels of Burt, 3 step-sons, Chad, A.J. (Vicki), and B.J. (Jessie), brothers & sisters: Lyle (Karen) Karels of Burt, Steven (Jane) Karels of Ionia, Patti (Paul) Brandenburg of Fredericksburg, David (Pat) Karels of Burt, and Deb (Ken) Brandsma of Wendell, Idaho. Sid is also survived by granddaughters, Kinley and Kendyl, as well as four step-grandchildren, many nieces and nephews, and his dog Izzy. He is also survived by two aunts, Arlene Karels, of Lakota, and Arline Karels, of Henderson, Minnesota. Sidney was preceded in death by his parents, his maternal and paternal grandparents, and many aunts and uncles. Visitation for Sidney will be held at the Burt Presbyterian Church on Thursday, June 21st from 5-7 pm. A memorial service will be held at the church on Friday, June 22nd at 1:30 pm. Bruce Funeral Home of Fort Dodge is in charge of arrangements.